Neiva Huila, Colombia - Brazil won big, 74-33, in the final game against Argentina and were crowned 2011 FIBA Americas Champions, earning a spot in the 2012 London Olympics. Brazil started off with four quick points from Damiris Dantas and Micaela Martins, imposing its effective offensive attack in the Argentineans from the right from beginning. Their height advantage and offensive rebounds by the Brazilians was the story of the first part of the game. A three-point basket Adriana Moises Pinto increased the lead to 11-0 with 5:54 remaining on the first quarter. Argentina scored only 4 points for the rest of the quarter, which ended 16-4, with baskets of Damiris Dantas and Erika de Souza to conclude the first 10 minutes of play. Six points in a row Brazil team increased the lead on the scoreboard at 20-4, in the first minute of the second quarter. And the trend continued, the speed and effectiveness of Moises Pinto were too much for an Argentina team that was erratic shooting from the field, hitting just one field goal in 21 attempts with 4:00 minutes remaining in the first half. The first 20 minutes of play ended with a score of 33-11 in favor of the Brazilians. The second half started with 4 points from the Erika de Souza and Damiris Dantas, answered by a three-point basket from Sandra Pavon, who seemed to come out more aggressive in the third quarter. The Brazilians continued their effectiveness in the quarter, which ended with a score of 59-19. With just 25 minutes of playing time, Erika finished the third quarter with 13 points and 16 rebounds, dominating Argentina. The fourth quarter was just an exclamation point in the game, for a victory that proved once again the difference in the level that existed between Brazil and the other teams in the championship right from the start of the tournament. There was a mixture of elements that made this kind of result possible, on one hand the Brazilian team came out with their best shooting game, while Argentina had its worst in the whole tournament. 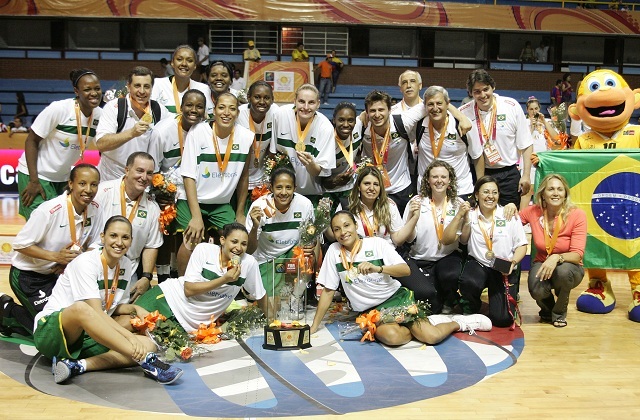 The match ended 74-33, and Brazil was crowned champion. With the victory, the Brazilians earned the spot to the next Olympic Games in London 2012. The most valuable player (MVP) of the tournament was the Brazilian Erika de Souza, who also formed part of the dream team championship with Oyanaisy Gelis from Cuba, Kim Smith from Canada, Erica Sanchez from Argentina, and her Brazilian teammate Adriana Moises Pinto.